In this episode, Emily interviews Dr. Brandon Renfro, a finance professor and financial advisor. Brandon shares the tortuous path that led him to his current faculty position at East Texas Baptist University and side business in retirement advising. 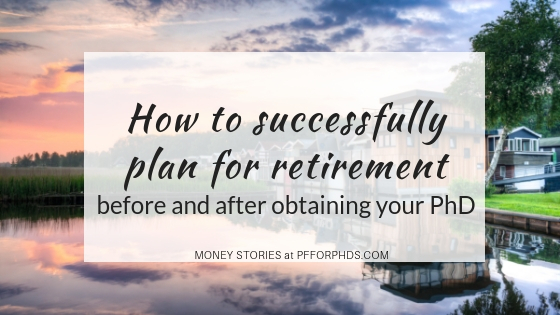 They discuss the long-term financial effects of doing a PhD – both positive and negative – and how to have a successful retirement even if you can’t save (much) during your PhD training. Dr. Brandon Renfro has a PhD in Finance. He is both an academic and a practitioner. He advises retirement advising for individuals. He does financial planning while being a tenure track professor. 2:02 What was your career trajectory? Brandon says that he “walked backwards” or stumbled into his PhD. As an undergraduate, he planned to go to law school. He was advised to major in business in preparation for law school. He took an American enterprise course and saw a presentation about the time value of money in the retirement planning context. This presentation inspired him, so he majored in finance and loved it. He went to law school but says he crashed and burned. He was in the military and had GI bill benefits. He decided to use his GI bill benefits for an Master of Business Administration (MBA). He asked his MBA advisor about adjunct teaching. He had to have 18 graduate hours in the discipline to teach a course. He discovered he loved teaching. He decided he wanted to teach full time. He feels fortunate that he got a tenure track position at a liberal arts college in Louisiana, where he worked for three semesters. Now he is in his third semester at East Texas Baptist. Emily points out that Brandon tried stuff and saw what stuck. Brandon agrees that this is important to explain to students today. He says many students set a goal and stick to it no matter what, even if the path isn’t right for them. He says there is a time when you should recognize if you don’t love what you’re doing and you should try something different. Brandon says he would tell his 18 year old self to major in finance, but at the time it didn’t occur to him. Emily asks how Brandon handled the sunk costs of going to law school. Brandon clarifies that he didn’t meet the GPA requirements to continue law school but he wasn’t sad about it. He says he was miserable in law school. He had taken out loans to pay for the year in law school. He says it was $20,000 that he spent to learn that he didn’t want to be an attorney. He says if he looks at it like it’s money he spent to learn that he loves being a finance professor, it was worth it. 7:47 Given that a person has decided to do a PhD and maybe a postdoc, what are the effects of their financial outlook? Emily starts by explaining that graduate students, postdocs, and early career PhDs have a lot of anxiety around saving for retirement. Most of these people are in their 20s or 30s and they know they are supposed to be investing for retirement. But planning for retirement feels overwhelming in the context of their competing financial demands, like student loan payments or saving for a house down payment, coupled with their suppressed income for an extended period of time. Brandon says that if you put off starting a career to do a PhD, this will make saving and preparing for retirement a little more challenging. These are foregone years of savings. However, academics have the ability to work past typical retirement age. As a professor, you can work longer and save money for retirement for more years, even if you start work and start saving a little later in life. Emily clarifies that PhDs can add years on the back end, instead of on the front end, to the total years that they can work to save for retirement. PhDs can do this because their work is fairly intellectual, and hopefully they get better with time. It’s less daunting to add years at the end in these career paths than others. Brandon says it’s (physically) easier to talk about what you know than it is to work on a factory floor, and you can prolong the years you do this kind of work. Even as PhDs reach retirement age, they have options to be an instructor, lecturer, adjunct, or consultant. You can work less than a full time load, and still capitalize on your years of experience. Brandon says even while you’re working in your 30s or 40s, you have the ability to leverage expertise outside the classroom. Even if you are working a full time tenure track position, you have a lot of knowledge that you can leverage in industry, even while you’re teaching. Emily shares that when she was an engineering PhD student at Duke University, she saw plenty of professors had consulting businesses or wrote books. In academia, there are many ways to step outside your primary role and leverage your expertise. Emily says that there are plenty of opportunities to have side hustles all through your career. She is part of a community of self employed PhDs, and many people’s self employed job is on the side of their full time job. Brandon believes there is a lot of potential for academics to be self employed. He says even if you were the lowest ranked student in the lowest ranked PhD program, you still have knowledge and you are already part of a select group. Emily says any PhD can find a market where their skills are valuable. They give examples of formatting and copy-editing and tutoring. 17:13 How can someone handle the income jump after the suppressed income period of being a trainee in a PhD or postdoc? Brandon says in one phrase, avoid “lifestyle creep.” When you suddenly go from an undergraduate or PhD student lifestyle based on lower income to receiving a full time income, you need to be mindful to not immediately start living at the new income. He says you don’t need to be extremely frugal, but use a moderate amount of your new income to build your emergency savings, pay down consumer debt, and pay down student loans in order to be much better off in the long run. Emily shares the standard personal finance advice to commit a large percentage of your raise to your financial goals. Either all of the raise or as much of the raise as you can, put it towards goals instead of your consumption spending. She says it applies even more when you have a large income jump. Most of it should be used to accelerate financial goals. When Emily and her husband finished their PhD programs, they applied this concept to their new “real jobs” income. They had several financial goals that they focused on and avoided lifestyle creep. Brandon shares his story about buying a house. He was unsure where he would get his tenure track position, but he wanted to build equity without committing his family to a large mortgage payment. He bought a small rent house before they bought a house to live in. Emily brings up that some people rent their properties as they move, in contrast to how Brandon purchased the property purely as a rental property. 23:40 Grad students and some postdocs don’t pay into the social security system. What are the long term effects of missing out on these years of contributions? Brandon explains that social security benefits are based on 35 years of covered earnings. Essentially, it’s an average of your highest 35 years of earnings. If you’re starting to contribute later, do the math. If you’re in your early 30s, you may be in your late 60s before you have 35 years of covered earnings. The issue is that your benefit will be calculated with some zeros in the 35 year average, which skews down your average. When you’re on the back end of your career, this may influence your decision to work for a few more years to replace some of the years where you contributed zero dollars to social security. 26:59 What steps can someone who’s in or recently been in PhD training do to mitigate negative effects of lower income and not contributing to retirement? Brandon brings up the psychological benefit of being used to living on a small income. He says to continue to live like that for a couple of years so that you can build yourself a financial cushion and start saving for retirement. He says eventually the feeling goes away and you get used to the new level of income. Psychologically, it’s harder to start saving for financial goals later. Emily says that this is classic personal finance advice. Sometimes the lifestyles of PhD students are lower than those of college students. She says it’s difficult to deflate lifestyle. You might see the higher paycheck from your first real job, then you lock yourself into higher housing costs or buy a new car. It’s difficult to take a step back, but it’s much easier to keep a similar lifestyle and put the new income to your financial goals and slowly work up your lifestyle. 30:16 If a person starts saving during graduate school, what kind of effect can that have on retirement? Brandon explains the first presentation that he saw on the effect of compound interest. If you started when you were 18 years old and you saved just $2,000 per year in a retirement account, you would have a million dollars for retirement if you simply earned the average market return. He says the same is still true if you start at 30 or 32, but there are a few less years for compounding to take effect. Emily says that even during graduate school, saving a couple hundred dollars a month is accessible. It’s not a thousand dollars every month that you need to save. The earlier you take these steps, the more and more impact it can make. It really does make a difference to take these steps earlier. Brandon adds that at least, don’t make negative steps. Buying a cheaper car or cheaper clothes can go a long way. Emily says that the professional students, like law students, were living a higher lifestyle even though they were living on loans. She says the smallest amount of debt that you have to take on during training will make it easier for you in a few years. 35:50 What do you do for clients? Brandon can help with anything within realm of retirement planning. He can help someone starting out. He can help graduate students and postdocs sort through their different options for retirement plans. He can help with decisions about how to invest within retirement plans. Brandon encourages you to take retirement very seriously and to think very hard about putting off retirement. He says it’s really hard to make a strong case against contributing to a plan with an employer match. He says employer match is essentially free money. Emily says an employer match is a 50% or 100% return on investment. Emily clarifies that someone looking at different options can ask Brandon for help considering which option to prioritize. Brandon can help overcome “analysis paralysis.” Brandon says something is almost always better than nothing, and you need to just do something. He encourages you to envision your retirement and what your financial goal looks like. Brandon’s contact information is at brandonrenfro.com. If anyone has a question about something that he hasn’t published an article about on his website, send him an email and he will write about it! Not all graduate students will be eligible to contribute to an IRA because IRAs require “taxable compensation” (formerly known as “earned income”). “Generally, compensation is what you earn from working” (source) and includes wages, salaries, and self-employment income, among other few other types of income. A few types of income that are not earned are rental income, interest and dividend income, and pension income. The question of whether or not you can contribute to an IRA will come down to what kind of tax forms you receive in January. If you receive a W-2, you have taxable compensation and can contribute to an IRA from that income. If you receive a 1099-MISC with box 3 income, a 1098-T, a courtesy letter, or no notifications whatsoever, the form indicates that portion of your income is not eligible to contribute to an IRA. Remember that you can contribute to an IRA up to your amount of taxable compensation for the year or $5,500, whichever is lower. If part of your income is compensation, you can contribute to an IRA from that portion – this may be the case if you switch funding sources between school years or between the academic year and the summer or if you have outside self-employment income. Also, if your spouse has taxable compensation, you can contribute to a Kay Bailey Hutchison spousal IRA (up to $11,000 between both IRAs). You will often hear about traditional vs. Roth IRAs and 401(k)s. In both cases, your contributed money grows tax-free, so the chief difference between the two is when the money is taxed. In the case of a traditional account, you take an income tax break when you contribute the money and are taxed when you take distributions from the account. The Roth is the reverse – you pay income tax on the money when you contribute it, but the distributions are tax-free. The main question to ask is whether you believe your income tax rate is currently higher or lower than it will be when you take the distributions. While this answer cannot be predicted perfectly because tax rates are subject to the political process, many graduate students are sacrificing income in the short-term for long-term income potential, so it is likely that their incomes and tax rates will jump after grad school and increase with time. Therefore, the Roth seems to be the better choice for most graduate students and young people in general. Even the most tax-break-enthusiastic professionals will tell people to contribute to Roth IRAs when they are in the 15% tax bracket or lower. You should also consider tax diversification. If you are likely to have a higher-paying job in the future and plan to contribute to a traditional 401(k) or similar, you can diversify your tax situation by contributing to a Roth IRA now. That way, in retirement, you will have more flexibility with your distributions, paying tax on some of your income but getting some income tax-free. Retirement savings is likely the longest-term savings goal you can set, and yet it is so beneficial to save for it early and continually because of the time value of money. The time horizon for the goal is so long that you can invest the money aggressively when you are younger and gradually shift the asset allocation to be more conservative as you near your retirement date. It is advantageous to invest your retirement savings in a tax-advantaged account like an IRA or 401(k) so that the money can grow tax-free. As a graduate student, you likely do not have access to a workplace-based retirement fund like a 401(k), 403(b), TSP, or 457. If you have taxable compensation, though, you can contribute to an IRA. In 2015, the most a person under 50 can contribute is $5,500 or the amount of earned income, whichever is lower. Additionally, if you have a side hustle and are self-employed, you may want to set up a retirement account for self-employed individuals (solo 401(k), SEP IRA). Once you decide to save for retirement such as in an IRA and confirmed that you have earned income, you will have to decide whether to open a Roth or a traditional version. I'll send you my 2,500-word "Five Ways to Improve Your Finances TODAY as a Graduate Student or Postdoc."